Northern Illinois University women’s golfer Connie Ellett was named to the Mid-American Conference’s 2014 Women’s Golf Academic All-MAC Team, the league announced today. A native of Hampshire, Ill., Ellett boasts a 3.8 grade point average while pursuing her degree in business. 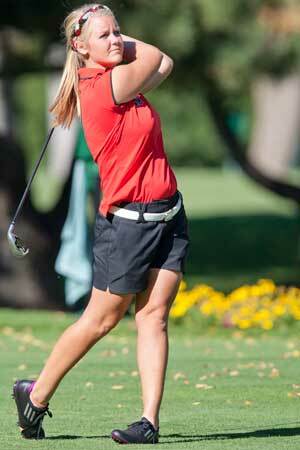 She averaged 79.2 in 23 rounds of golf, which ranks third on the team. Ellett competed in 10 of the Huskies 11 events in 2013-14. One of 11 golfers named to the 2014 Women’s Golf Academic All-MAC Team, Ellett earned MAC Women’s Golfer of the Week following an outstanding performance at the Islander Classic. She took 16th place after shooting a career-low 228, which is the eighth lowest score in school history for a 54-hole tournament. The Huskie junior tied her career-low for a single round with a 74 in the second round of the Redbird Invitational and carded a 157 at the Bradley Invitational, a season low for a 36-hole event. Ellett finished 22nd at the MAC Championship with a 240. In addition to Ellett’s selection, Samantha Coyne (Bartlett, Ill./Bartlett) garnered Honorable Mention accolades. Coyne maintains a 3.4 GPA in biological sciences and averaged 80 in 23 rounds of golf. Ellett’s selection this year marks the third-straight season a Huskie has earned a spot on the Academic All-MAC team. Casey LaBarbera (Marinette, Wis./Marinette) made the team last year, while Allie Parthie and Kelsie Passolt took the honors in 2012.